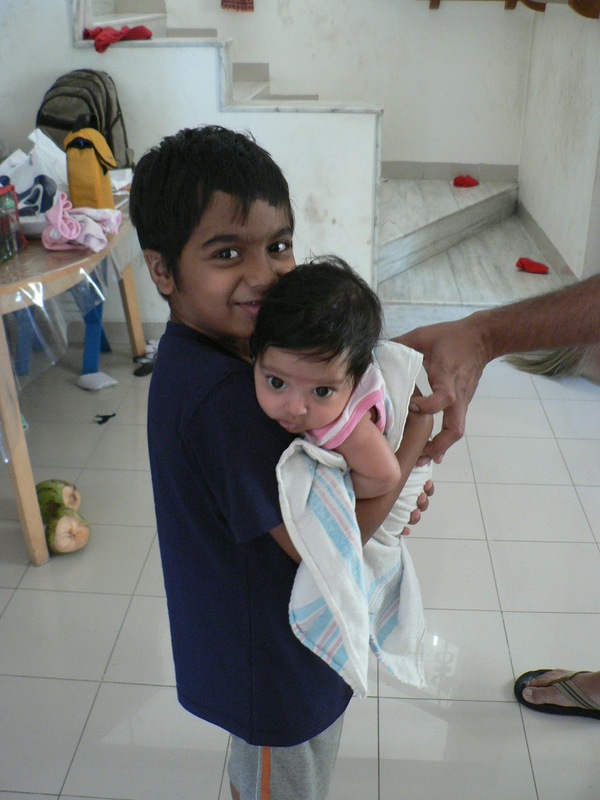 Raghu holding his 3 month old cousin, Avni. Since my sister and Avni were with us for more than a month, Raghu and Zoya got loads of time to observe the baby. 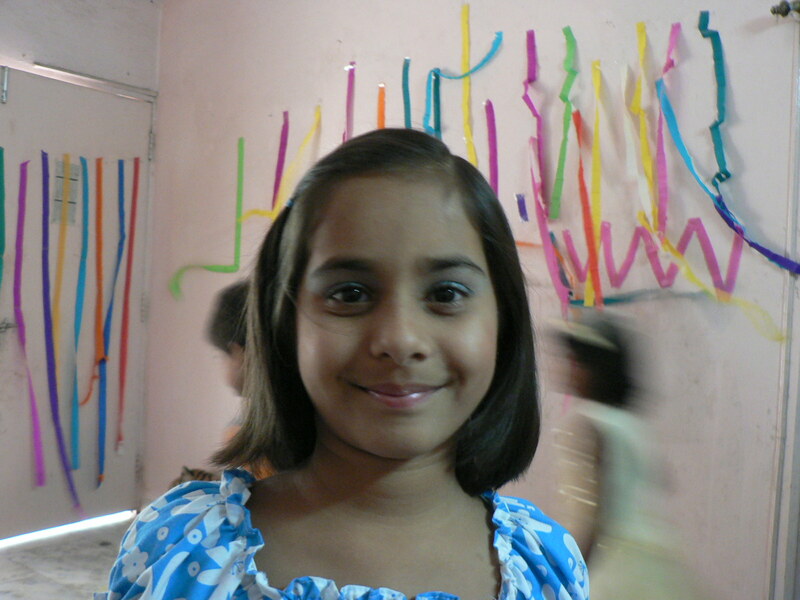 Raghu was often lying down beside Avni and talking to her or waiting for the morning smile and gurgle session. It was sweet to see. Zoya paralleled her play… she would change her baby’s diapers whenever Veena changed Avni’s. Or feed or walk around trying to burp the doll. 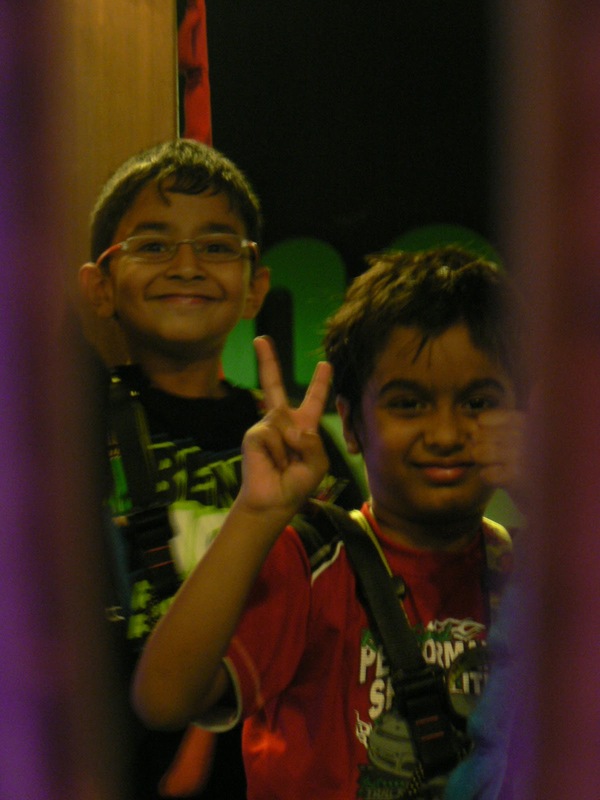 Raghu and his friend Shubhankar in Singapore. They had just completed an indoor rope walking session. Raghu and Zoya in a huggy mood. 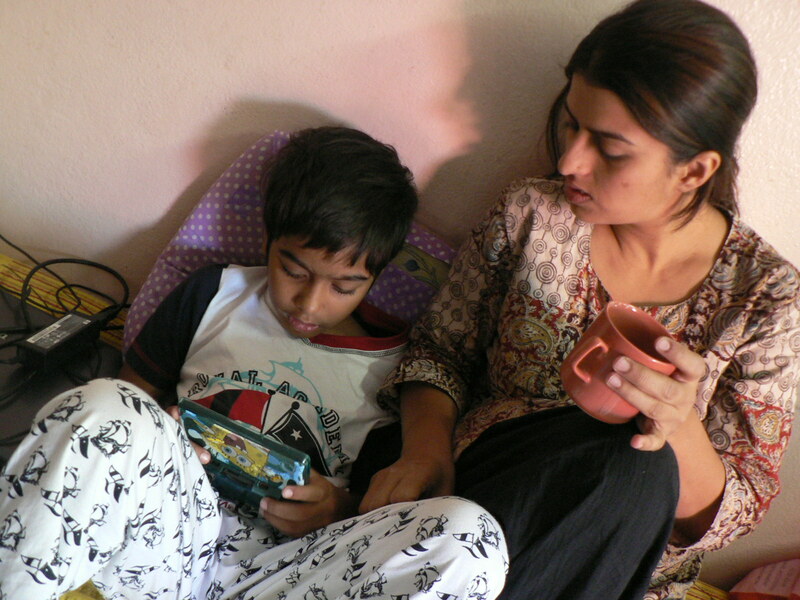 And me with my morning tea talking to Raghu about his ninja game during our stay in Indore. He says he prefers fist fighting to guns. Why? Cause with a gun you finish off the fight fairly quick. But with your fists you can keep going for a while 🙂 Loads more fun. 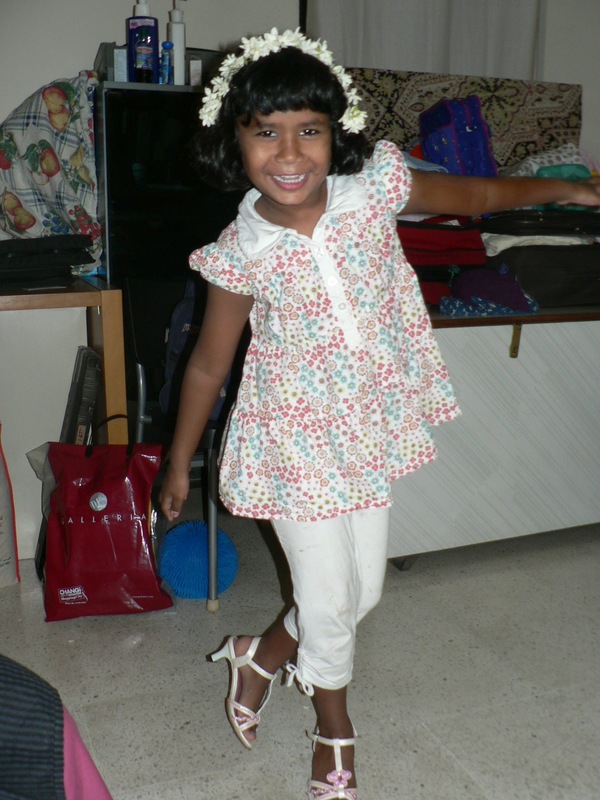 Zoya and her Ammamma enjoyed fresh flower garland arrangements in their hair. These were jasmine. Notice Zoya’s new heels. She twirls around with them a lot. 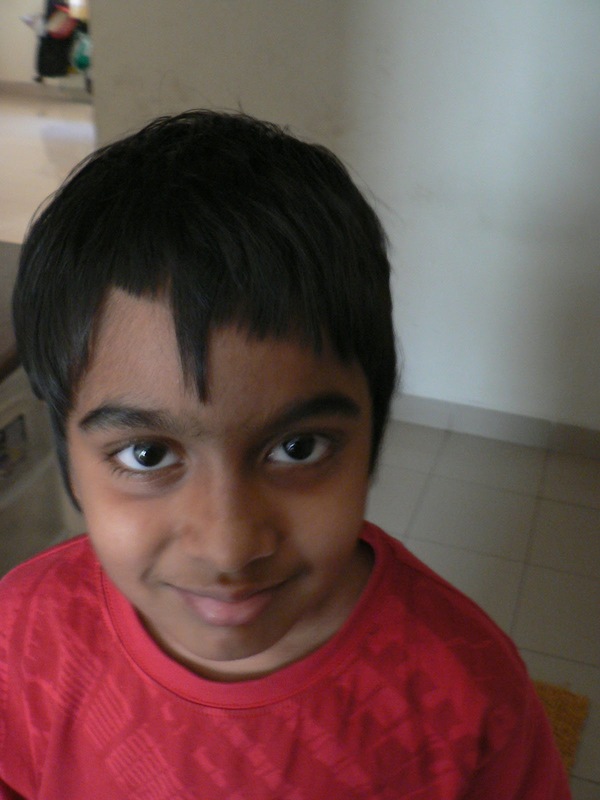 This is Raghu’s most recent haircut that i did on a whim based on his request “make it a spiky cut amma”. Well his hair falls flat and silky so he does use gel from time to time to really make it stand up. We were both pleased with this hairstyle. This is what i shared with someone on the punehomeschoolers group today. 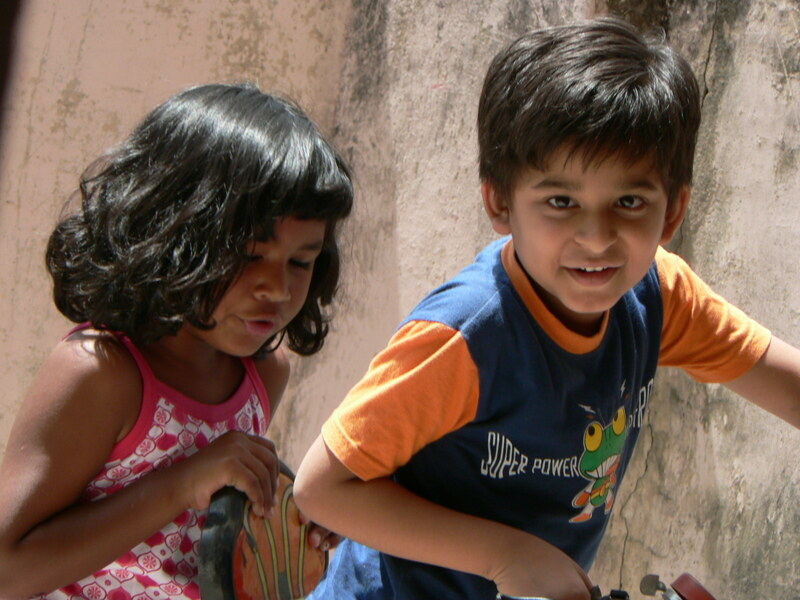 Raghu was into words like Coelophysis and Iguanodon at age 4 but could not read words like cat, mat or bat :-0 I was getting into homeschooling/unschooling at the time. I have always been an avid reader and my children often see me with books when i have time. I also read to them each night almost… its a ritual they love. I also read to them whenever they ask me to thru the day. I never shame them .. even when Raghu would ask me something that i felt he could have easily figured out. If i ask Ravi what is 53.6 divided by 8.8. He gives me an answer. He will not ask me to figure it out, or go calculate it myself or say “what? you don’t know that much?” or “i’m sure you can figure it out… now try”. He knows that I ask him cause he is a walking calculator and i need a quick answer and he is free to help. Simple. Similarly i would always tell Raghu any word he asked me to read. I never got into phonetics unless he was trying to sound out the word and wanted my help. Mostly video games and captions on DVDs and tons of books that he loves inspired him to read. I never expected a particular age or time for reading. I simply live with him and treat him like i would like to be treated. No condescension. Surprise, surprise… he reads beautifully, sometimes haltingly and enjoys the activity most when reading Asterix and Obelix books or traveling in airports and reading signs and warnings to me. His vocabulary is huge and his reading is catching up. 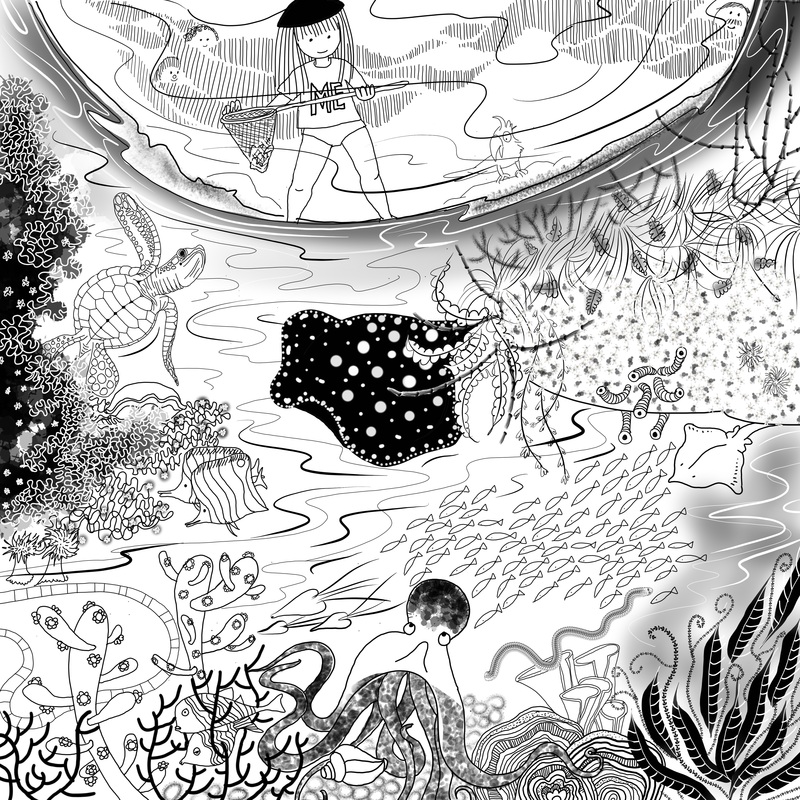 Sandra has a lovely page here: http://sandradodd.com/reading that gave me courage when i started out unschooling… as i then felt Raghu might never read … esp. the way he was at 4 🙂 Silly, silly me. And i would still be happy no matter what age Zoya reads at. Ravi has to attend a conference here in Singapore this week. So being the free-as-birds-unschooly family we tagged along. Raghu was game the moment we asked if he was interested. He remembers everything here quite vividly. We lived here from the time he was 4 till he turned 5. We got the kids a scooter each (the 2 wheel, balancing, foot-propelled ones) and they have been zipping around happily. Singapore is amazing… good, clean food is very affordable and easily available everywhere, its safe for travelers with young kids, very kid friendly – lots of escalators, elevators, excellent public transport, loads of parks/playgrounds and some really nice museums AND as Raghu keeps reminding me, lots of smooth ramps, smooth tiled areas for his scooter to zip on. He wants to skate too. We’re not doing any of the more pricey Sentosa, Universal Studio like things. From the list Raghu and I came up with the focus is wandering around parks, playgrounds, museums and trying loads of food faves and some Lego shopping. 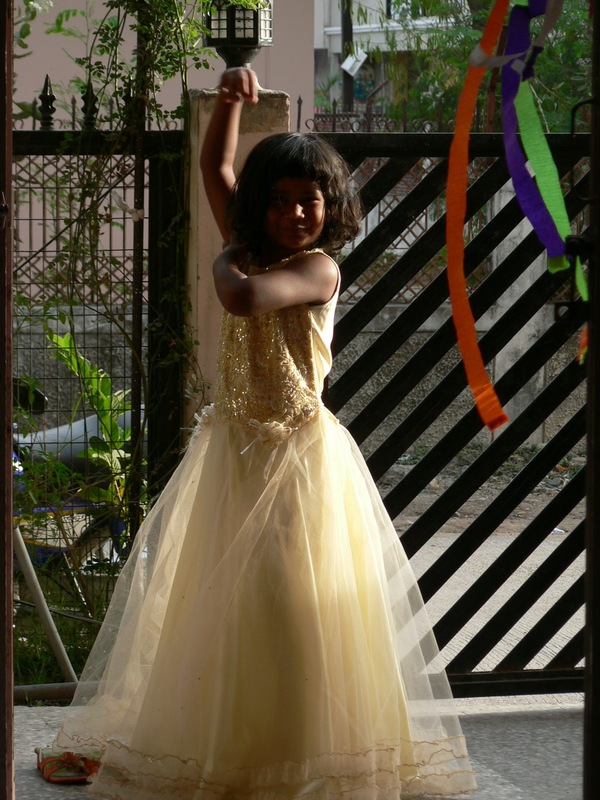 Zoya only wants a new playground each day :-)… easily done. Ravi is busy but will make time for a sunrise till lunch bicycle ride at the East Coast Park on Saturday. Today the kids are sleeping in and relaxing. Post noon we are meeting a friend and her sons at the Jurong Science Center. 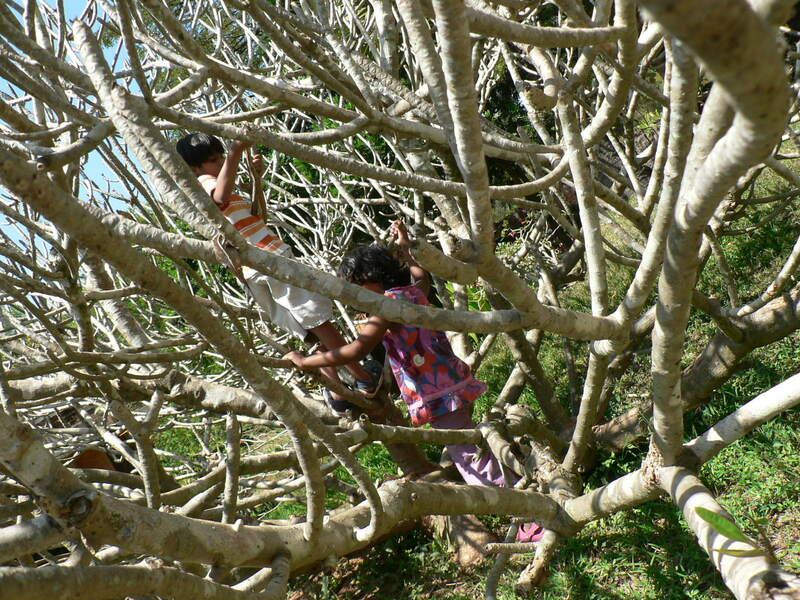 Thats where raghu’s first real experience of a tree house started. They have a lovely one in a high tree in the surrounding gardens. For now I’m looking forward to them waking up. 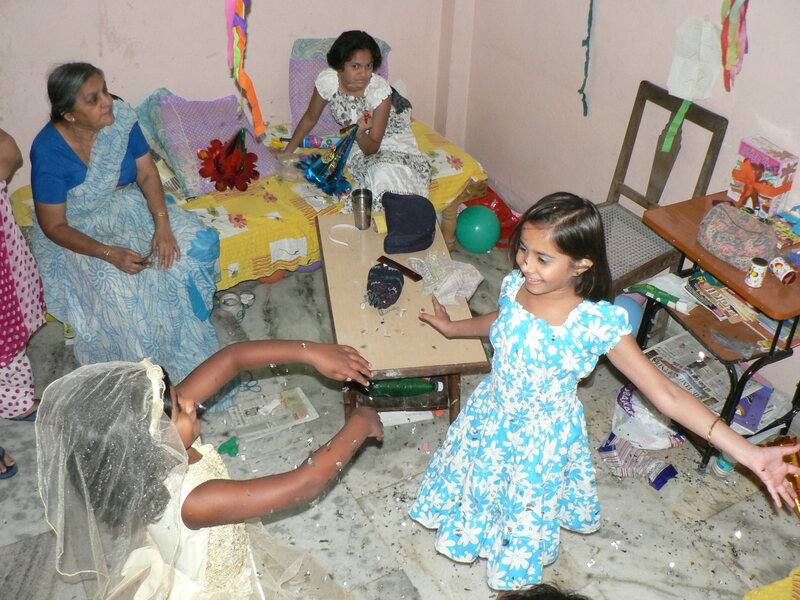 The aunt, grandmother and grandaunt gave gifts of money (amazing things were bought for zoya with this, uncle and aunt gave pretty dresses. We did a make-up session, dress up (special birthday gift from my parents to satisfy Zoya’s princess desires), lots of yum food (Ravi’s aunt is one of the few awesome cooks i know), games, chilling out, pizza outside, water-balloon smash hits, balloon popping and playing, lovely cakes (courtesy Ravi’s sister) and the list goes on. 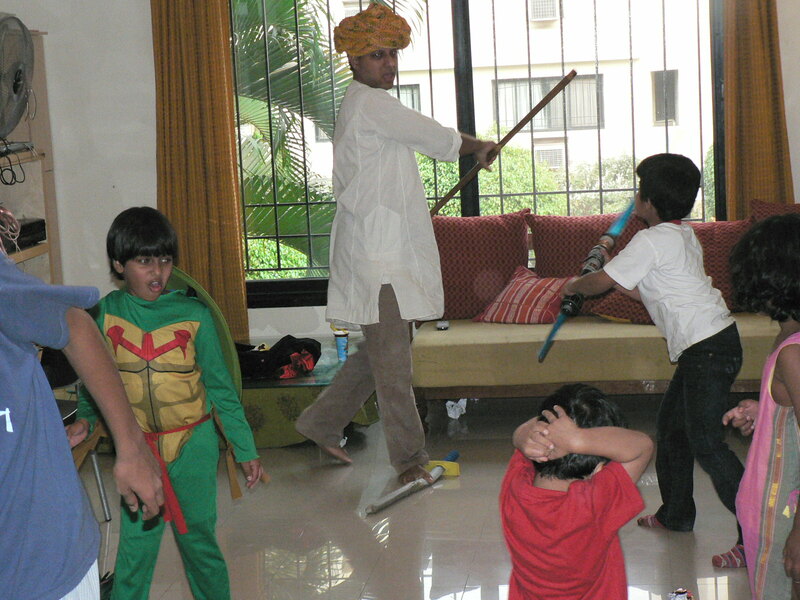 Ravi’s family’s enthusiasm ensured a splendid birthday celebration. Some pictures are here. Others will be uploaded soon as my internet speed is better. Or perhaps its my comp that needs to be upped. 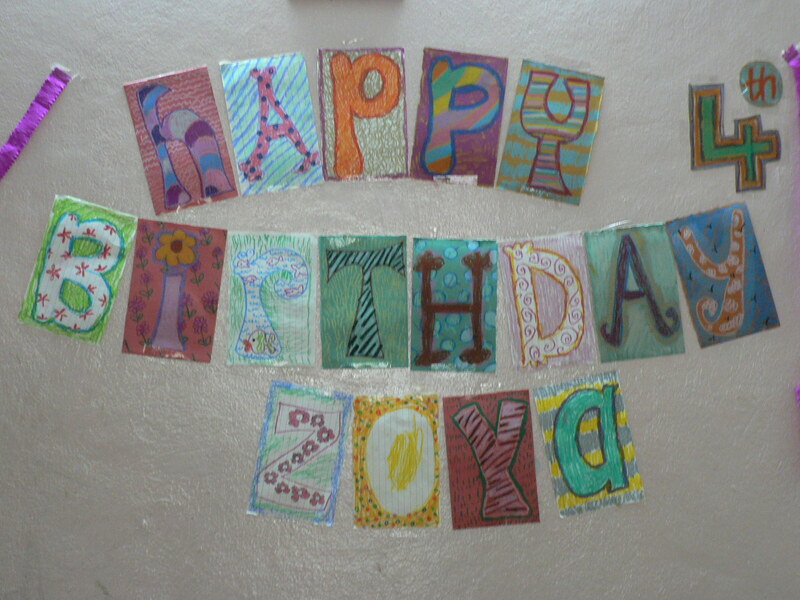 Its Zoya’s 4th birthday tomorrow. 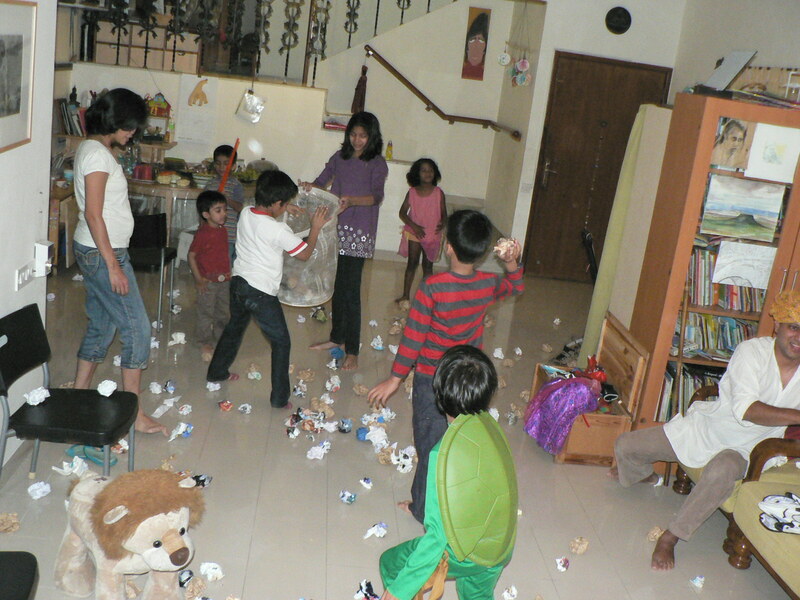 As i’m way behind on posting here… i thought i’d quickly add some photos from Raghu’s paper-ball-meant-be-snowball-fight, 7th birthday party photos and some from our various outdoor sessions. The party was a success. Our homeschool friends and neighbours and some family members joined in our cooperative musical chairs, pin the tail on the caterpillar, snowball war, fancy dress, sword fighting etc. 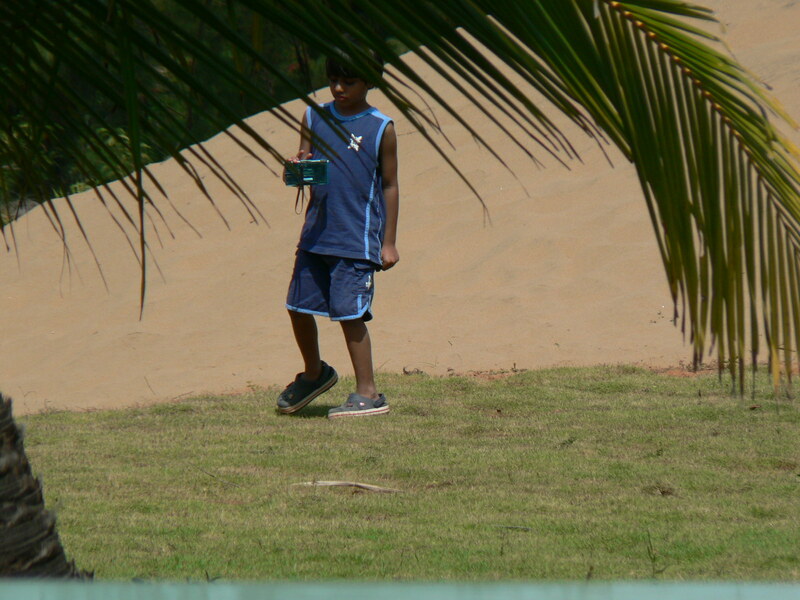 One of the photos is of Raghu holding his DS and wandering around by himself on the Dune Hotel sand dune. He loved that place so much and kept going between sea, pool, pellet shooting, and finding new spots to play his DS in. 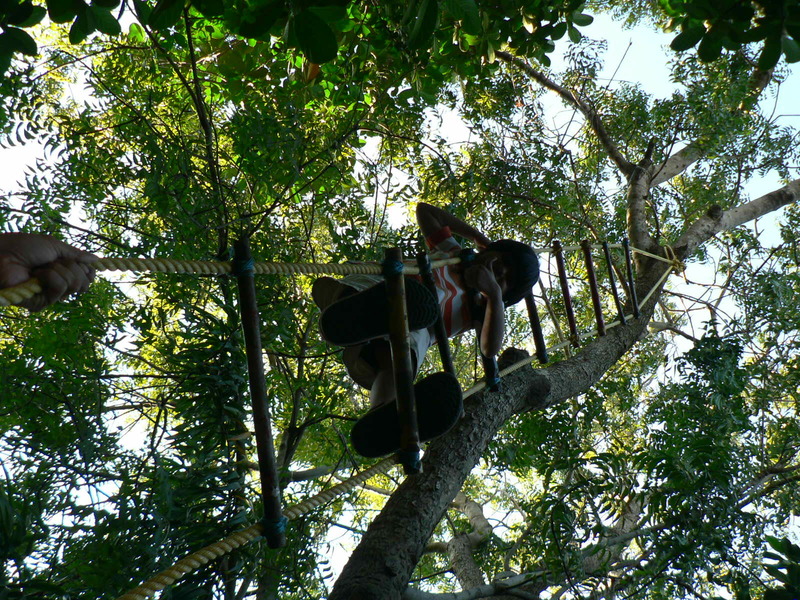 And one is of raghu climbing Ashwini and Karthikeyan’s rope ladder.